The public dialog about agriculture in California and beyond is largely negative, with tales of agribusiness nefariousness commonplace. This is despite the fact that 98% of America’s farms are still owned by families. Farmers are literally feeding us every day, but are routinely pilloried in social media and elsewhere by a very vocal minority. This presents a classic disconnect between perception and reality. The broad perception is that “farmers” and “farming” are code words for “gigantic corporations trying to make a fast buck”. Somehow along the way, the general public forgot the face of the local farmer. Into this breech stepped the California Agricultural Communications Coalition (CACC) – the umbrella organization representing the voice of the farmer. CACC was assisted by the communication consultants at AdFarm, an agriculture speciality agency (disclosure: Convince & Convert client). The mission: to humanize California’s farmers. AdFarm built an online story portal called Know A California Farmer, that includes videos, photos, written accounts and other content about growers of everything from avocados to lettuce. Amazingly, not a single word, picture, or video was created by AdFarm or the CACC. Instead, they conducted dozens of social media and content creation training sessions, bringing farmers out of the fields and onto laptops and mobile devices to learn how to shoot and upload multi-media content. The stories at Know A California Farmer aren’t authentic just because they are true, but also because they were 100% created by actual farmers. You think you have a tough time with social media adoption and content creation in your company? Try teaching a subset of California’s 80,000 farmers how to optimize a YouTube video. In addition to the Know A California Farmer site, individual growers were taught how to create social outposts for themselves and their farms on Twitter, Facebook, YouTube and elsewhere. A key component of this initiative is the fact that all of California’s farmers are potential spokespeople, and now know how to confront distortion and engage in reasonable dialog with agriculture opponents in the “wild” of the social Web. “Amazingly, many of the participating farmers are competitors on a day-to-day basis. For them to work so closely together on this humanization effort to support the overall industry is a triumph of cooperation and big picture thinking,” said Josh Lysne, Director of Digital Marketing at AdFarm. 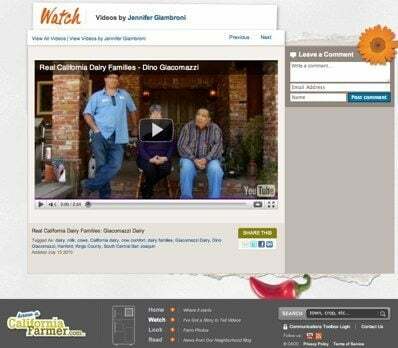 With zero paid promotion, the Know A California Farmer site received more than 1,000 visits on its very first day, driven almost entirely by social mentions spurred from farmers’ individualized uses of social networking. More stories are being added to the site routinely. Pop on over and check out this example of social advocacy at work, won’t you?